On the surface, Thor and his cast of characters can seem a little bit silly. They all talk in this flowery Shakespearean accent, and walk around on rainbow colored roads. As a kid, I was never big on medieval trappings, so a bunch of characters sword-fighting or throwing hammers didn’t seem that appealing. I was entirely wrong. In preparation for the release of Thor: The Dark World, I decided to finally give the much-celebrated run of Stan Lee and Jack Kirby on Thor a try. What I found was arguably the best cast of characters in all of comics. Batman and Spider-Man may have great supporting casts, and a deep roster of excellent villains, but the villains only sporadically appear, and the supporting casts are made up usually of civilians. Great civilians, but civilians nonetheless. 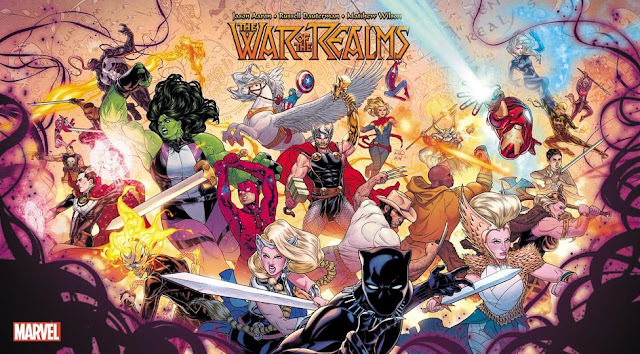 The great thing about Thor’s supporting cast is they’re all great heroes in their own right, perfectly capable of supporting their own ongoing comic book series. 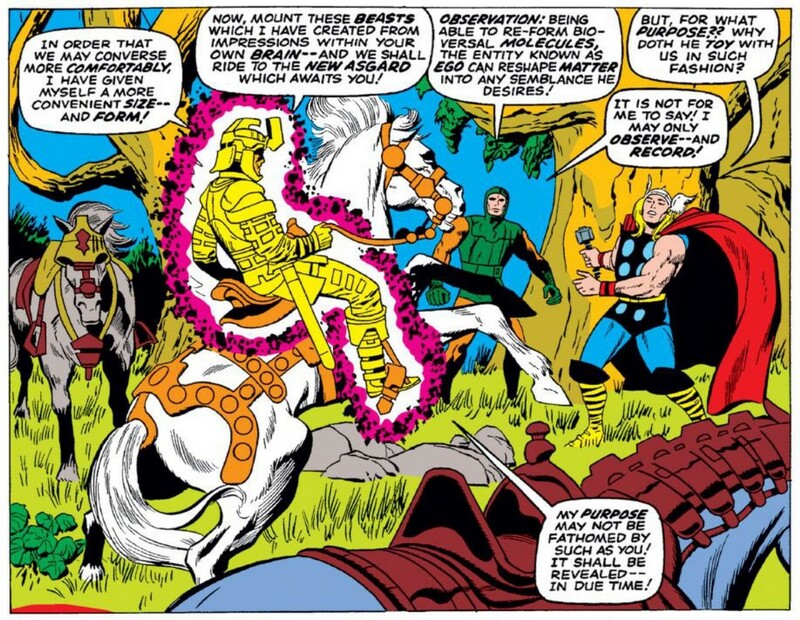 The Warriors Three, Sif, Balder, and Loki have all had their own comic at some point in time, to name a few. Along with great allies, Thor has a wonderful roster of frequent antagonists. My love for Karnilla the Norn Queen is already documented. Fangirls have been swooning over the exploits of Loki for years now, thanks to the movies. 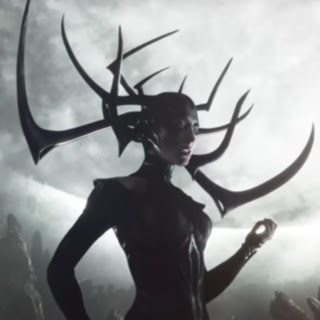 There’s also Ulik, Odin himself, the Enchantress, the Executioner, Malekith, and last but not least, Hela the Goddess of Death. Hela, as played by Cate Blanchett, looks like she’s going to steal the show in the upcoming Thor: Ragnarok movie, which is no easy task in a movie that teases a fight between Thor and the Hulk. 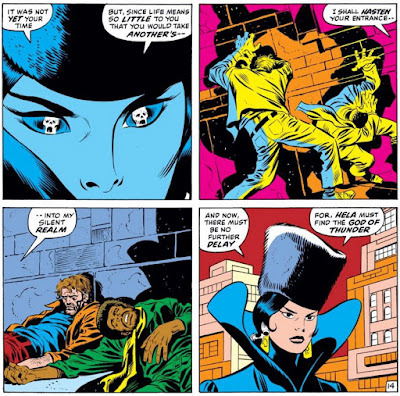 Which means there’s no more perfect time to look at her comic book beginnings than now. 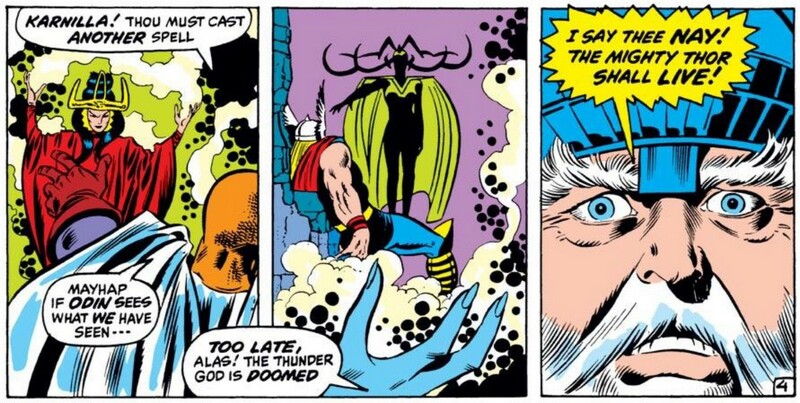 Quick tangent, in the main story Thor meets the mysterious Ego the Living Planet. As Guardians of the Galaxy Volume 2 killed at the box office early in the summer movie season, and Ego coincidentally was a major part of the film. 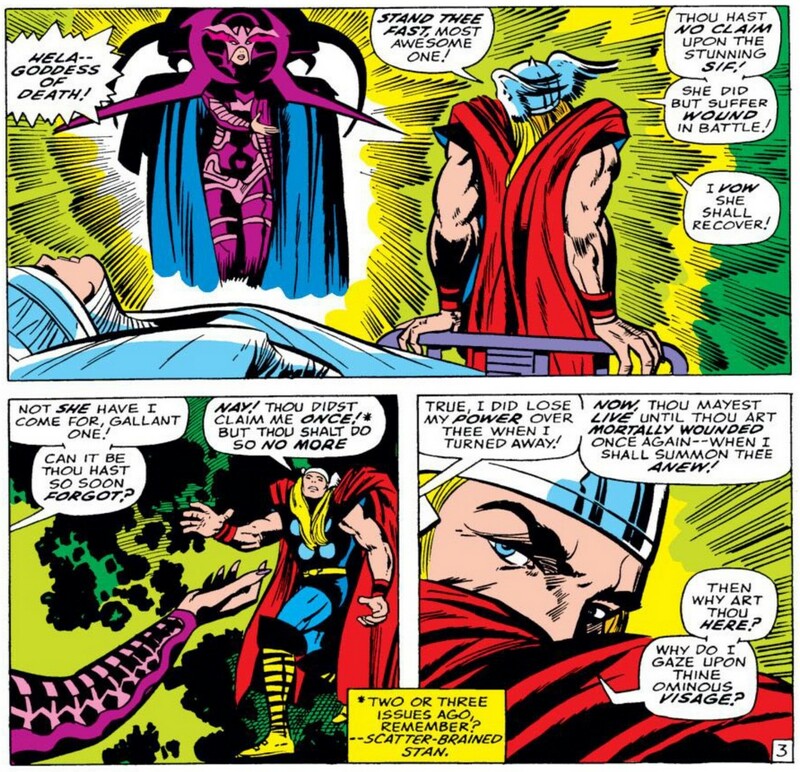 Here’s a panel of Ego creating a mortal body for himself. Anyway, none of that has anything to do with Hela, I just thought it was relevant to current Marvel fan interests. In another Tales of Asgard backup, Harokin, leader of the barbarian hordes, has been fatally defeated in battle by Thor. All of Asgard gathers around to witness the arrival of Hela, who has come to claim the fallen warrior. 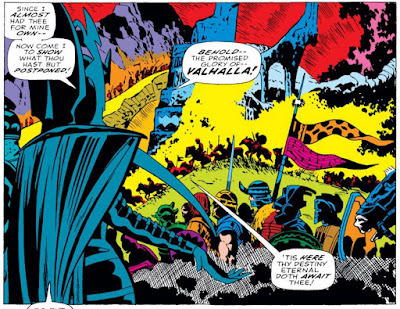 All of Asgard must then turn away as Hela and her latest victim make his final voyage into the afterlife. Yet, when Harokin arrives at Valhalla, he is greeted by friends and the promise of an eternity of endless battle. A perfect end for a mighty Norse warrior. All of the Thor characters are pretty wonderfully designed. 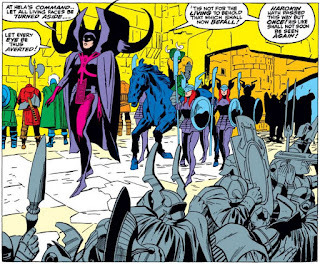 Hela and Karnilla in particular, both have those fantastically complicated headdresses, which are simultaneously glorious and impractical. I’m sure both women are figuratively made of steel, but that still has to put a strain on the neck, mighty or not. Thanks to the evil machinations of Loki and (my beloved) Karnilla, Thor has been bested in battle by The Wrecker. On the edge of death, Thor is visited by the specter of death herself, Hela. Thor convinces Hela that while a spark of life remains in him, she cannot yet claim him. 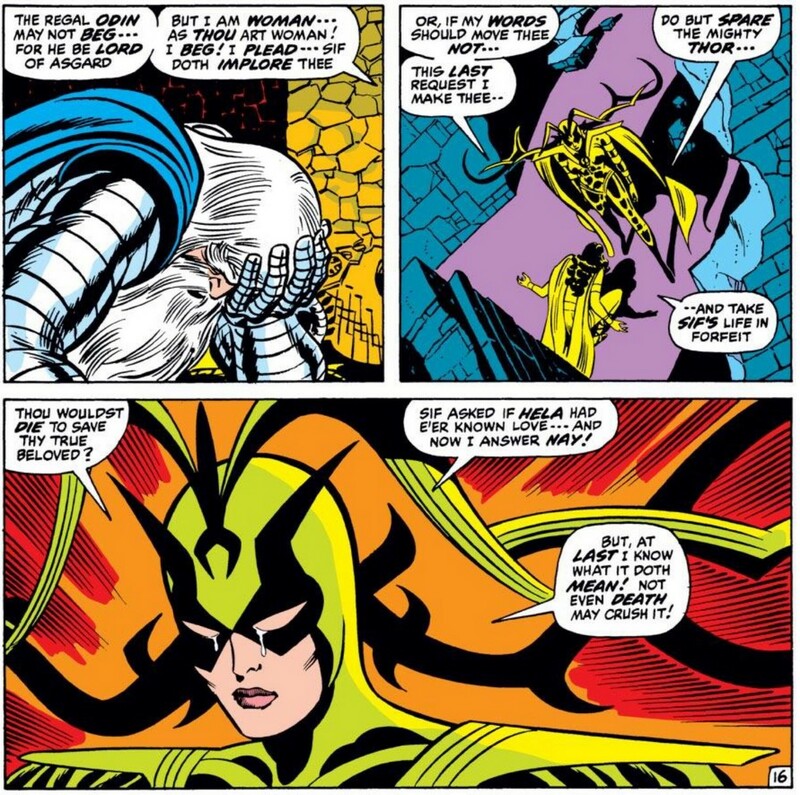 Hela is patient and therefore agrees to turn her back to him, essentially letting him go. She fully expects that she will be escorting him to Valhalla soon enough anyway. 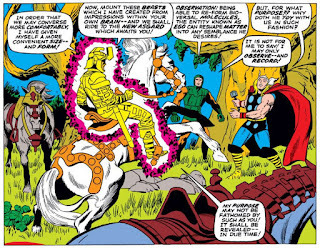 While Odin is locked in dangerous combat with the mysterious Infinity, Thor is lured away from the action by a strange faceless creature. 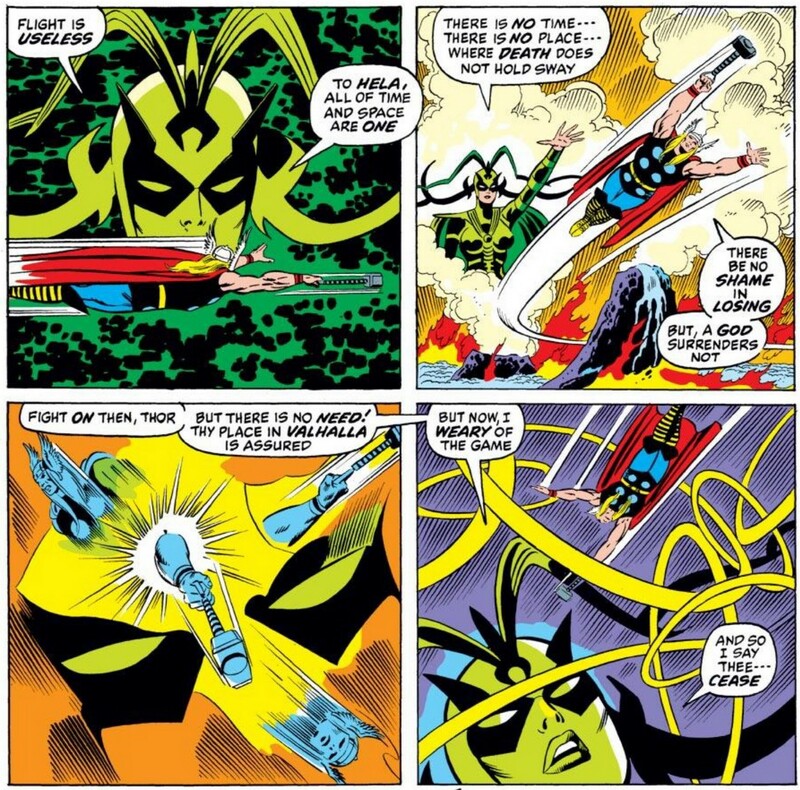 The creature had been sent by Hela, to lure Thor to her for yet another attempt at ending his life prematurely. 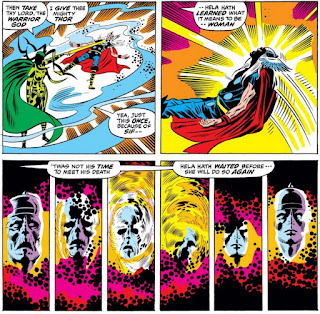 Thor resists, and so Hela hits him with a powerful bolt of energy that acts as an aging spell. 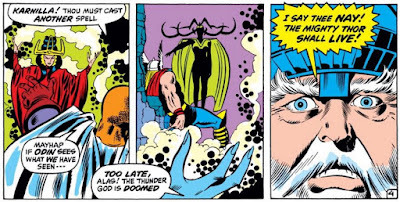 As Thor rapidly ages toward his death, Hela departs, confident that she will be able to claim him very soon. 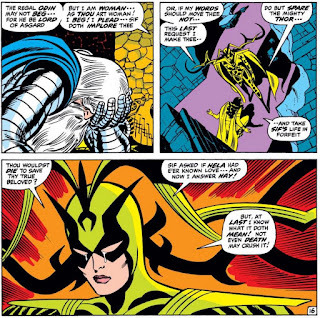 In the not too distant past, Hela had attempted to claim Odin’s spirit while he was in the throes of the Odin sleep, but his spirit proved too strong to be claimed, even by her. It split off into a powerful new entity she would subsequently name Infinity. She allowed Balder to free the other half of Odin that had remained in his sleep pod, setting into motion the events of the past few issues. 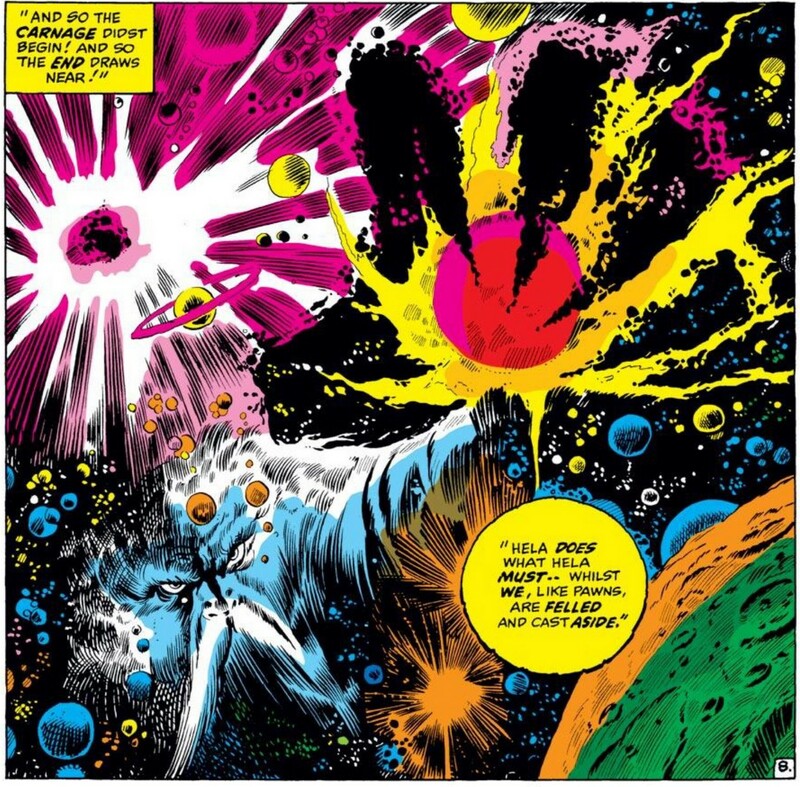 This is a great cosmic panel by Buscema and Sinnott. Hela is delayed for a bit by a few illusions Thor placed in different locations across the planet. Annoyed, Hela decides to make Thor come to her by threatening the lives of firemen who are in the middle of fighting a fire. When Dr. Blake gets the news over the radio that firemen are aging rapidly at the scene of an incident, he knows he must leap into action as Thor, even though Hela will surely be waiting. Thor arrives in time to save the building and snuff out the fire. 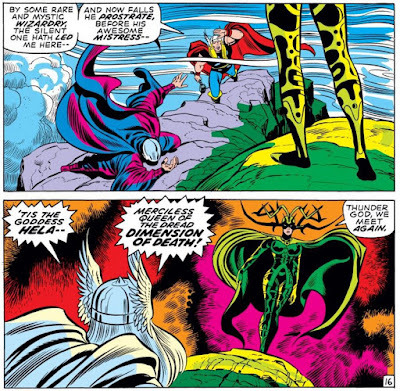 Thor prepares to fight off Hela yet again, but she threatens to kill all the mortals if he does not yield. Reluctantly, he does yield. 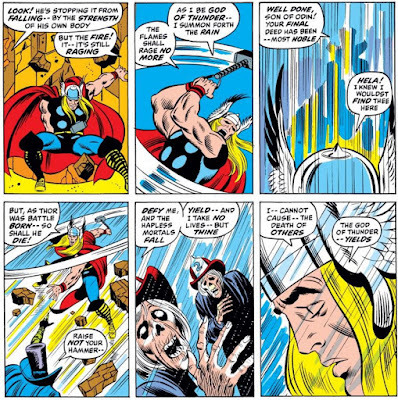 Balder pleads with Karnilla to open a window into the events on Midgard, so that Odin can see the danger Thor is in. 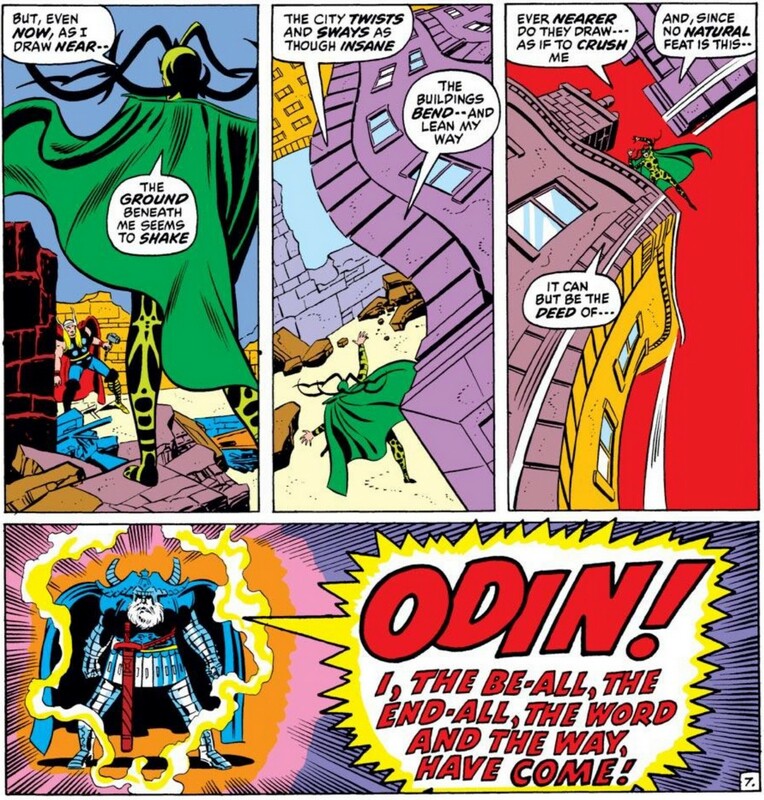 Sufficiently convinced to intervene, Odin uses his power to remove the mortals from danger, giving Thor a chance to escape. 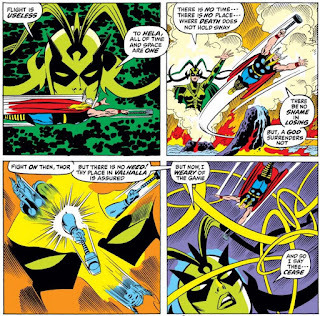 However, Hela is a master of all space and time, and Thor’s attempts to flee prove to be unsuccessful. 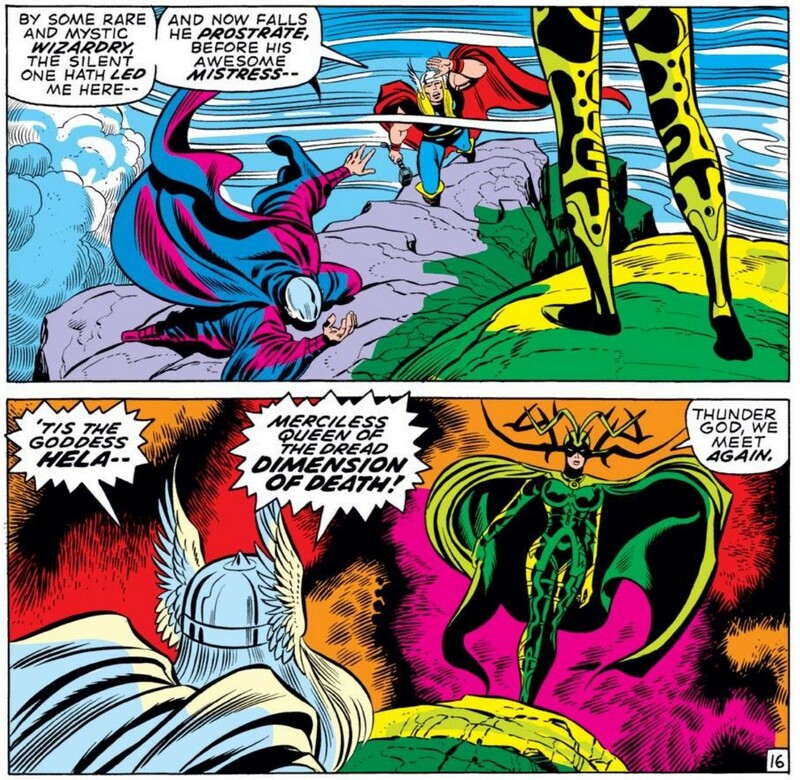 Hela moves in for the kill, but is interrupted by the arrival of Odin himself. 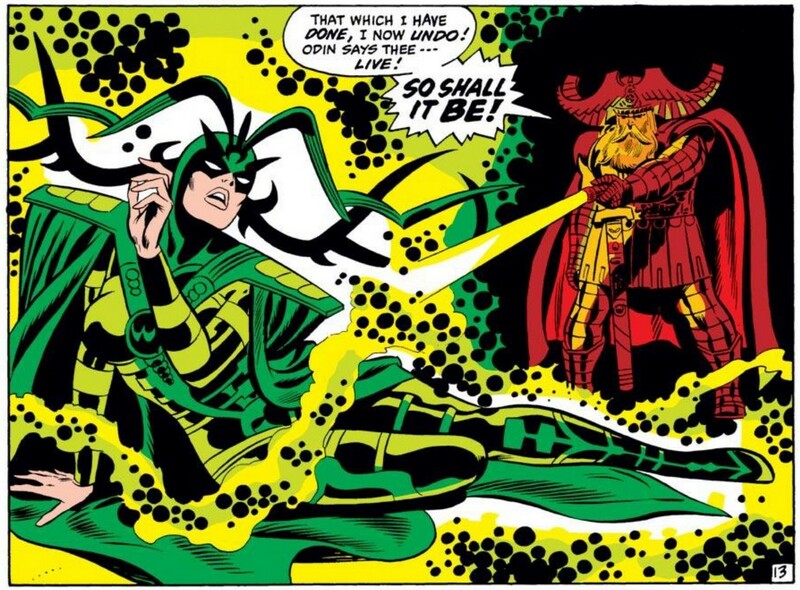 Hela is not impressed or deterred, and continues to move in for the kill on Thor. 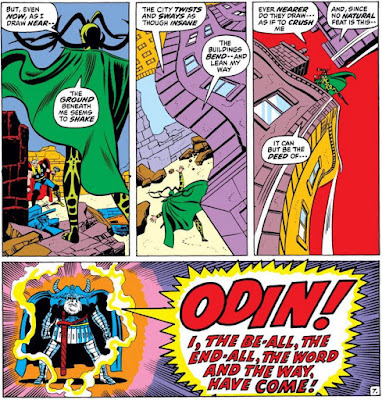 Odin intervenes, blasting Hela with his mighty scepter and killing her. Thor fears the consequences of killing death, and is quickly proven correct when the natural order of Earth is thrown into disarray. The population of insects triple, trees and plants overgrow and engulf the land, and people in pain are suffering without the sweet release of death. 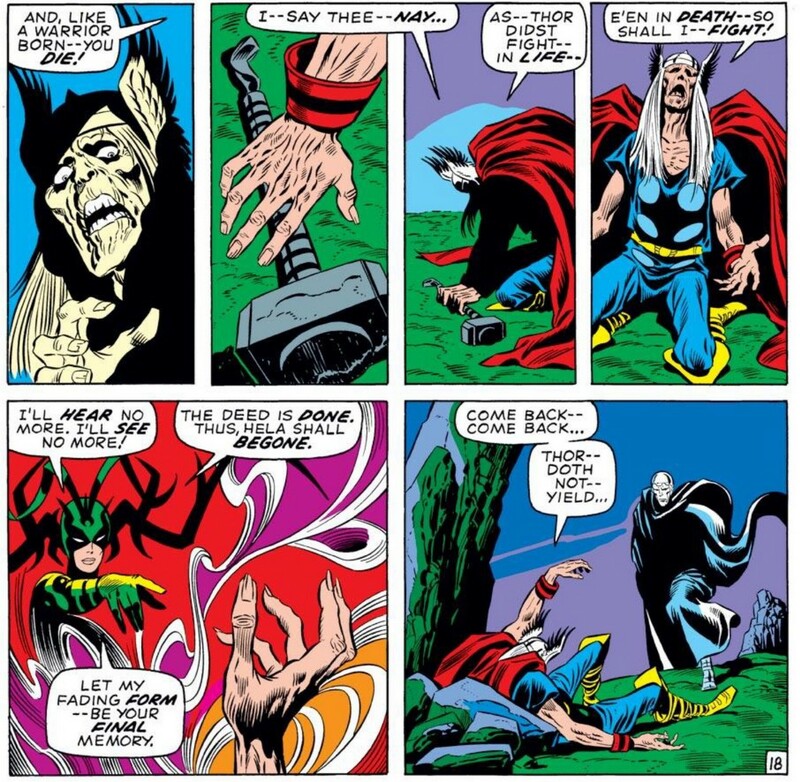 Odin knows that he cannot allow a universe without death to continue, even if it means his son Thor will die, and so he returns Hela to life. 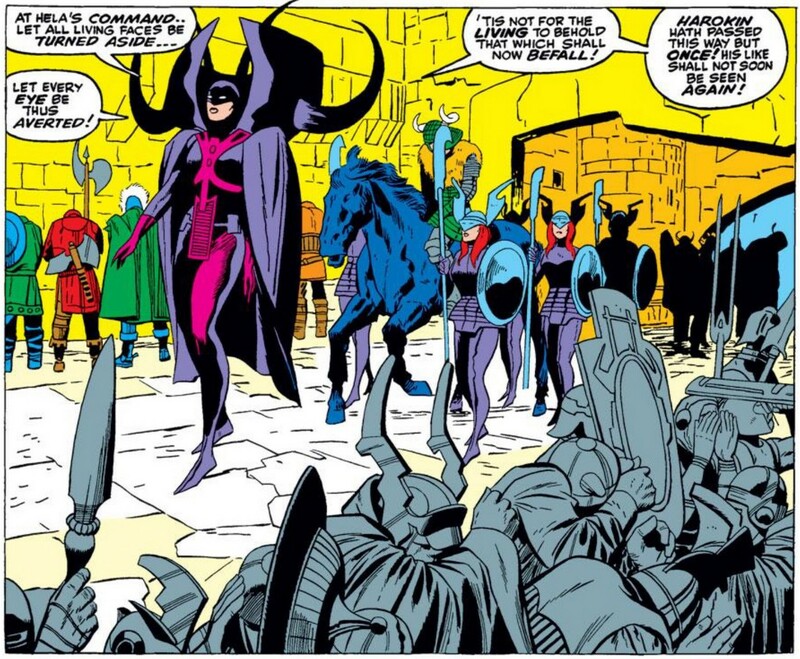 Hela, much like my beloved Karnilla, would make the most of her short time in the spotlight in her early comic book appearances. (Again, both women also seem highly enamored with overly complicated headgear. Coincidence? Yeah, probably.) So far, she’s been foiled every time from claiming the spirit of Thor as her own. Will she ever succeed? You should keep on reading and find out. 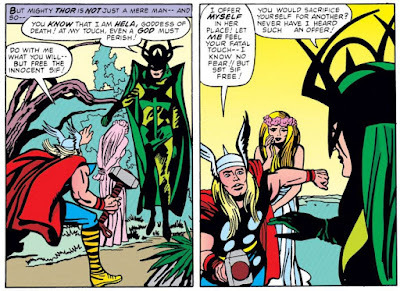 Or maybe, MAYBE, if I’m feeling up to it, I’ll continue chronicling the adventures of Thor and Hela in a part 2. But you all have to be nice to each other. Next time, maybe more Hela?